This is a book of dirty, muddy, bloody writing, putting the reader square in the midst of the battles, in the heads of the commanders and in the proverbial with the common soldiers. At times superlative, The Heroes is deftly paced and spiced with existential philosophy and violent psychosis. 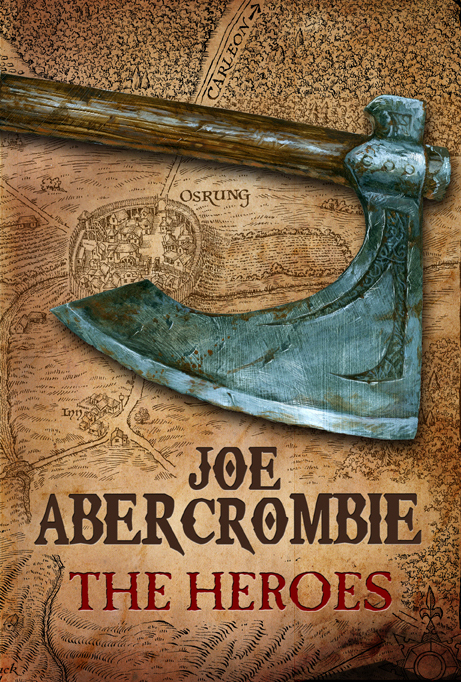 It is a familiar formula for Abercrombie fans, but the work of a writer growing more competent with each book. The setting of The Heroes sets it apart from his other works – this novel is almost a historical treatise on a famous battle. It is all the more complex for dealing with all sides, all the major protagonists. In fact, the novel is an endless circular examining and feeling of the battles from a dizzying array of characters’ points-of-view. There are many, many battles, but Abercrombie has effectively portrayed the politicking and manoeuvring of the powerful, and the tedium of the common soldier between the fighting. It’s an impressive feat and one that never had me becoming impatient. This is an attractive package. A big book, with maps enough to please. Abercrombie has said before on his blog that he isn’t a fan of world maps, but I think he (or his publishers) have made the right choice in this case (albeit that the maps included aren’t of a ‘world’ but of a single location). The background cover art itself the map and shows where the various buildings and terrain are laid out which does help to visual the fighting. If I have to find fault (I don’t), then the formula is perhaps too familiar. The battle-weary and world-weary warriors, constantly reflecting on their fears and regrets, are not new for Abercrombie. At times that there was a lack of distinction between the characters of his other novels and this one. Nonetheless, I believed them, I believed in them, for good or ill, and enjoyed every one he portrayed. Gritty, brutal, sad stuff but tinged with humour and a certain cynical joie de vivre. Loved it.